Common Causes of Bicycle Accidents in Florida | DeLoach, Hofstra & Cavonis, P.A. A bicyclist is encouraged to wear a helmet, take extra care when riding close to cars, and to stay visible by wearing bright and reflective clothing. While these practices go a long way in helping bicyclists reduce their risks of accidents, they're ultimately at the mercy of the cars surrounding them. Car accidents may be a daily occurrence on Florida roads, but people who are struck while walking or cycling in Florida are much less likely to walk away from a crash than a driver of a car. Bicyclists often suffer significant injuries because of a driver’s inability to share the road; a driver traveling too quickly to stop in time to prevent a crash; or simply because a driver wasn't paying attention. Rear-ending. Rear-end collisions are the most common cause of car-bike accident injuries. A biker may be hit directly on the back wheel—causing the bike to flip and the cyclist to land on the hood of the car—or struck on one of the back sides of the bike—forcing the cyclist off the road or into the opposing lane of traffic. These accidents are most likely to occur at night, especially if the cyclist doesn't have a rear reflector, and often involve drivers who are intoxicated. Left cross. Also called a left-turn accident, this type of crash occurs when a car traveling in the opposite direction makes a left turn in front of the bicycle rider. The driver may hit the biker on his side, causing him to be launched from his bicycle into the street, or run over the biker completely. If the driver pulls out in front of the bicyclist, the biker may collide with the side of the vehicle. Right hook. A driver traveling next to a bicyclist may fail to see the biker before making a right turn, cutting off the biker’s path. In some cases, a motorist may speed up to overtake the bicyclist and attempt to make the turn quickly in front of him, misjudging the time it takes to execute the turn. The cyclist may slam into the side of the car or be struck head-on as the driver makes the turn. Pull-out. Pull-out accidents occur when a driver backs out of a driveway or pulls forward from a side street without checking for oncoming pedestrian or bicycle traffic. A car that suddenly appears out of an alley or parking lot exit doesn't leave a cyclist any time to brake, making it impossible for the biker to avoid a collision with the front or side of the car. Bushes, poles, buildings, and other obstructions on either side of the roadway can make it more difficult for motorists to see cyclists, making these accidents more likely. Dooring. This type of crash occurs when an occupant of a parked car opens the door directly in front of an oncoming bicyclist. The opened door blocks the biker’s path, forcing him to stop, swerve into opposing traffic, or collide with the door or occupant. This type of accident is usually the fault of the occupant, who should check his mirrors before opening doors and exiting next to a traffic lane. Motorists have a duty to follow the rules of the road and respect the right of way of all vehicles, including bicyclists. 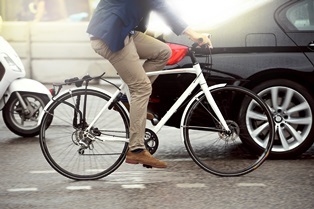 A bike rider who was injured because a driver did not maintain a safe distance or performed dangerous maneuvers should seek the advice of an experienced injury attorney. Our legal team can take over your case to get you maximum compensation while you take the time you need to heal. Simply fill out the form on this page today to make an appointment in our offices.